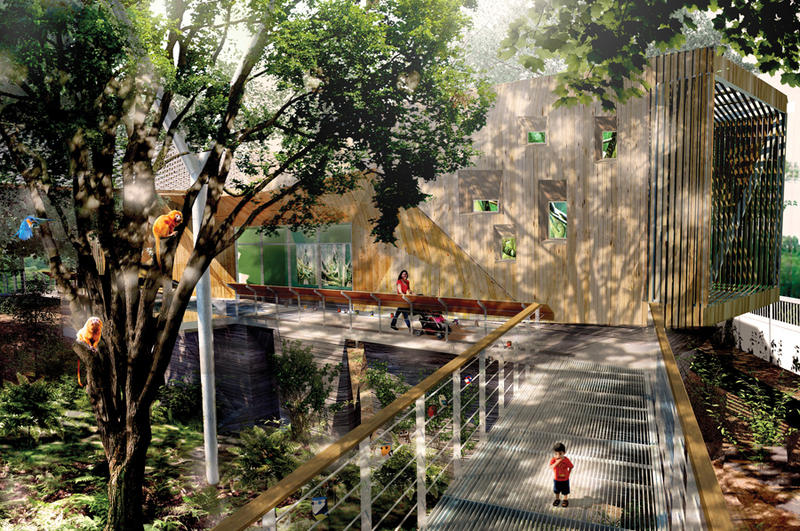 The “Above Zone” forms part of the Edmonton Valley Zoo’s ambitious redevelopment of its historic Children’s Precinct. 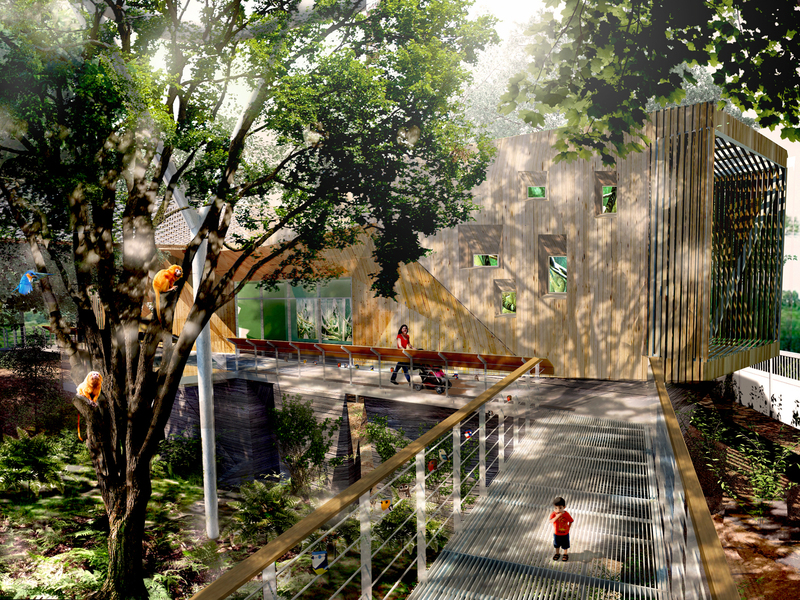 With immersive landscapes and a “child’s eye view” as points of departure, the broader plan for the precinct comprises four primary modes of spatial engagement as means of defining a new conceptual framework for the Zoo: Under, Between, On, and Above. These abstract experiential types structure the new exhibits based on how each species engages physically with that landscape and promotes play as the primary mechanism for engaging with that landscape. 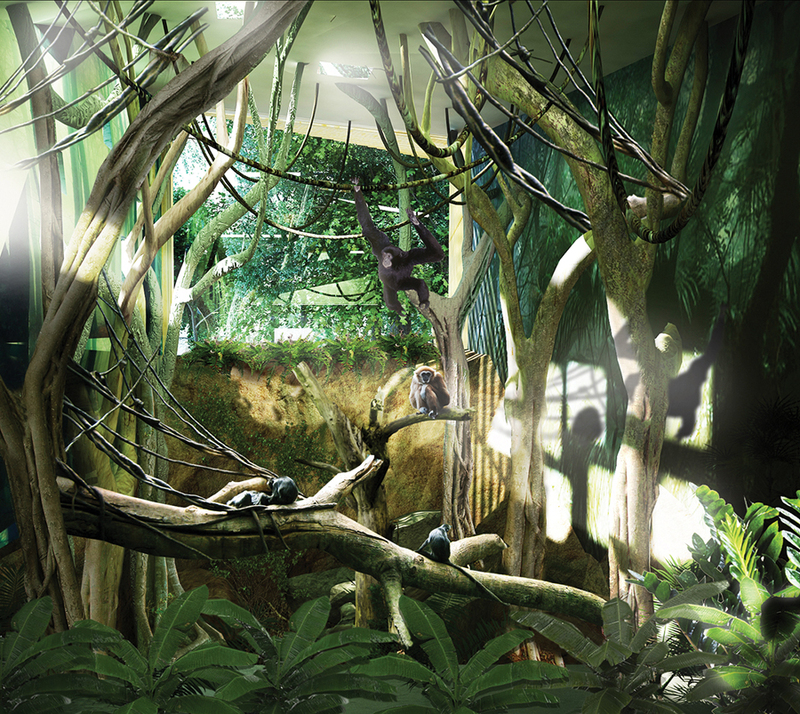 Immersive landscapes are those in which animals and humans alike are enveloped by a common habitat. This approach erases the boundaries and hierarchical divisions between animals and visitors found at conventional zoos. By engaging animals on their own terms and in their own habitats, visitors are better able to understand the high degree of interconnectivity between themselves, the animals they are viewing, and the world around them. The Above Zone utilizes a tectonic language developed through exploratory models to blur the boundaries between built and natural environments, suspending disbelief and drawing the visitor out of the realm of the everyday. The materials selected will acquire a patina over time: the wood will become grey, while the board-form concrete will be overgrown with mosses and ivy. The project’s faceted surfaces are eroded to provide natural lighting throughout the spaces, while views of the landscape beyond are harnessed to animate its interior spaces. The building acts as a frame for its surroundings and will eventually be subsumed by its context, literally immersed within the site. Within the logic of this language, the Above Zone focuses on the experience of ascending from a grounded condition to one characterized by the dissolution of the tree canopy into light and sky. The idea of a child’s geography, where imagination takes hold and reality takes a backseat to wonder, is another fundamental concept embedded in the design. For this, Maurice Sendak’s Where the Wild Things Are. A child’s geography is an experiential or cognitive map that reflects heightened moments of emotion within the promenade that resonate within a child’s long term memory. This mapping isn’t definitive or quantifiable; instead, the map is an accumulation of moments of engagement with habitats and animals that create a disproportionate effect on a child’s perception of the environment. In addition, parallel play opportunities will buttress the visitor’s imagination by providing moments of adrenaline, during which one can pretend to be one of the animals by mimicking similar physical acts. A child can climb in the net play and pretend to be a Gibbon, or cross the canopy walk between the aviaries and imagine life as an exotic bird or Tamarin. 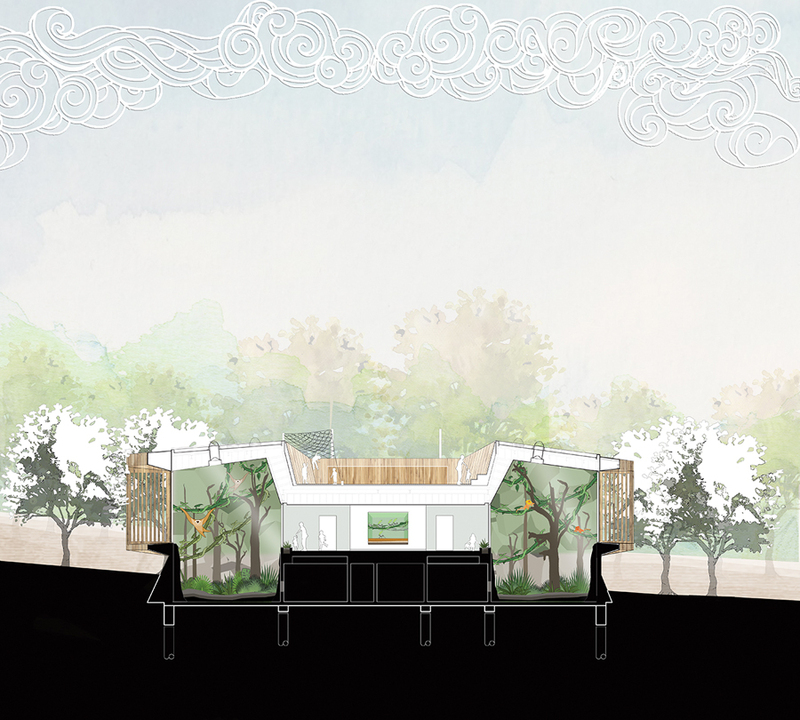 Over time, the project aims to realize the Edmonton Valley Zoo’s desire to encourage conservation and stewardship in future generations of Edmontonians by creating a meaningful connection between visitors, animals, and the ecologies and ecosystems that they share. Shirley Blumberg :: The project has a fresh and exuberant approach. It is a delightful rethinking of the experience of visiting the zoo. Jack Kobayashi :: This design packs more “programing punch” per square metre than any other. The building is loaded with functional requirements—often incompatible, discordant and requiring separation – and manages it all in a tight, cohesive package. If this were a gymnastics competition, we would award this project a bonus for artistic interpretation combined with a high degree of difficulty. Steve McFarlane :: The project resolves a simple path on a really tight site with fantastic programmatic richness and a wonderfully engaging complexity of experience. 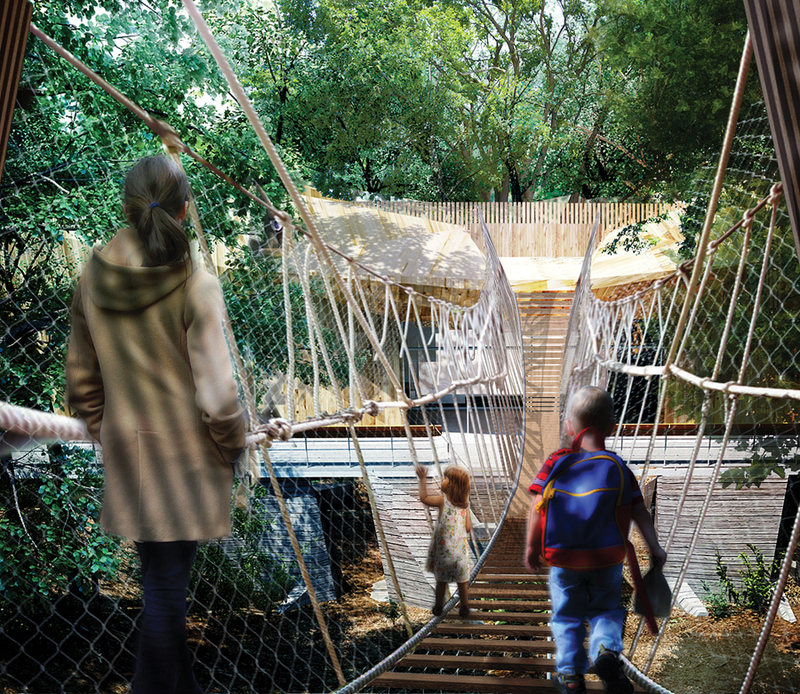 It displays considerable sensitivity in the design of the diverse animal habitat, while simultaneously harnessing the raw enthusiasm of child-play to the benefit of all ages.